(Phys.org)—A small team of researchers at IBM Research–Zürich, has found a new way to measure the friction involved when two planes of highly ordered pyrolytic graphite (HOPG) are moved against one another. In their paper published in the journal Science, the team explains how their technique works and what they found when using it with some graphite materials. Kenneth Liechti of the University of Texas offers a Perspective piece on the work done by the team in the same journal issue and suggests ways in which the new technique might prove useful for the design and reliability of nano and micro electrical systems. As work has progressed in developing 2D materials, most famously with graphene or nanotubes, other researchers have been busy studying such materials to learn more about their properties—the hope is that they may prove useful for developing extremely small electrical systems. For that to happen though, things like how friction works with them must be understood. Up until now, scientists attempting to measure friction involving 2D materials at the nano-scale have had to use probes, noting and measuring the oscillations that occur when two of the materials rub against one another. In this new effort, the researchers have found a way to measure that type of friction without having to touch either one of the materials. 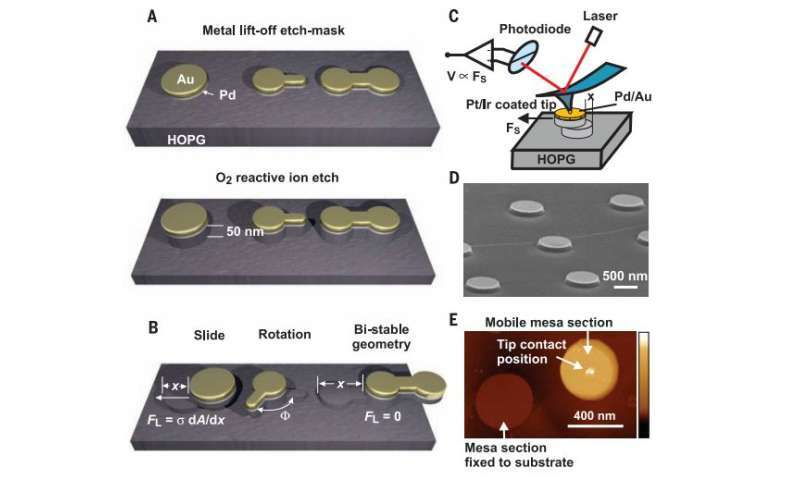 The team at IBM used an atomic force microscope to apply a shear force to two disks of HOPG (roughly 50nm thick with radii ranging from 50-300nm). The method allows for measuring the frictional impact on the discs when pushed in different ways—with lateral friction, for example when one disk is moved along a straight line against another, or when torque is involved by twisting or spinning one disk atop the other. As part of their research, the team also found several instances of equilibrium states that resulted from the movement of the disks against one another, a finding that could lead to a method of using HOPG materials as switches in a memory device. As Liechti notes, the researchers have come up with a better way to measure friction with such material use and with nano-scaled layered materials in general which could help pave the way for their use in future nano-scale devices. Small measurements and huge results for a small component. Slippery graphite and you measured the friction. Congratulations! Impressive.